CourseVector and the Spinal Bifida Resource Network formed a bilingual business partnership to combat the effects of Spinal Bifida through a campaign for expectant mothers’ health. What makes this partnership particularly noteworthy is the truly bilingual nature of this website. 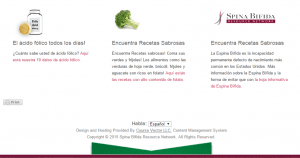 Simply by choosing the Language: English or Habla: Español at the bottom of the page, readers are allowed to switch between languages with ease. 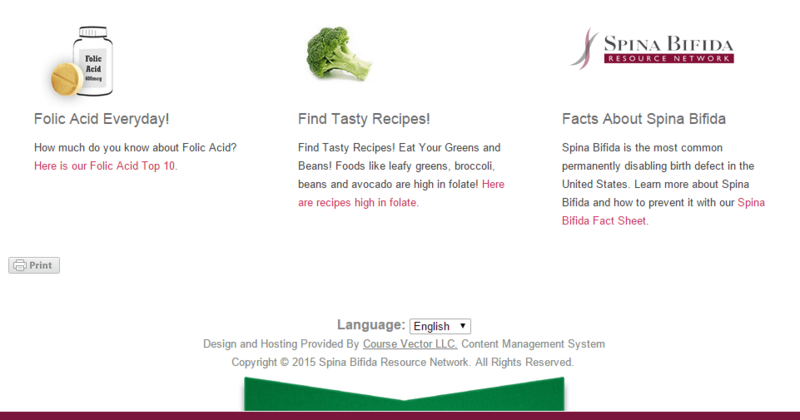 The ability to read technical and medical advice pages in the reader’s native language is a significant benefit to the Spina Bifida Research Network’s audience. CourseVector is duly proud of their association with this organization that provides so much in the way of selfless service to the Spina Bifida community. CourseVector set up the bilingual capabilities for the website, as well as the design and hosting, which permits the SBRN to contribute information regarding Spina Bifida and collect much needed and secure donations for the SBRN community. The family owned and operated Web design & hosting service, CourseVector, understands the challenge facing small businesses and nonprofits with a small budget and a big need to reach the communities they support with up-to-date information. A dynamic internet presence is almost a requirement in these contemporary times, when people expect to search and find everything they need. Just because yours might be a small business, with a small budget that does not mean it shouldn’t have the very finest website. Small businesses, nonprofits, and municipalities can have the dynamic website they need to provide them an internet presence for only $48 annually. That same WordPress website we normally charge $299.00 to design and publish online for everyone can be implemented and maintained by our support technicians for small businesses for just $4.00 per month, less than a cup of coffee. Contact CourseVector today and describe the website that will provide that internet presence and we’ll design.